We’d love your help. 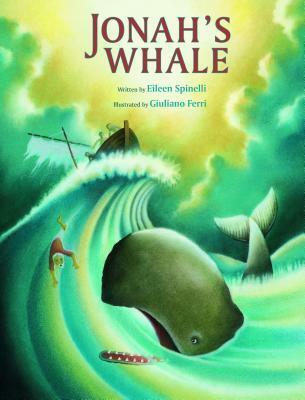 Let us know what’s wrong with this preview of Jonah's Whale by Eileen Spinelli. God made Whale and gave him a home in the blue-deep waters of the sea, a family with whom he could play and splash, and a joyful song to sing. And then one day, when a wild storm raged above, God gave Whale a job to do. Whale"s faithful spirit fills the pages of this vibrant story and gives a new twist to the classic, well-loved biblical tale. Eileen Spinelli"s charming re God made Whale and gave him a home in the blue-deep waters of the sea, a family with whom he could play and splash, and a joyful song to sing. And then one day, when a wild storm raged above, God gave Whale a job to do. Whale"s faithful spirit fills the pages of this vibrant story and gives a new twist to the classic, well-loved biblical tale. Eileen Spinelli"s charming retelling of this familiar story will delight readers of all ages, as will Giuliano Ferri"s rich and vivid illustrations. To ask other readers questions about Jonah's Whale, please sign up. The story of Jonah and the Whale, but from the Whale's point of view. Whale listened to God and obeyed much better than Jonah. This review was written for LibraryThing Early Reviewers. Beautiful and delightful book telling the old Biblical story of Jonah from the point of view of the whale. But not one my goddaughter has requested more than once. This is the story of Jonah and the Whale from the whale's perspective. The main character is simply called Whale. He lives with his family, eats and plays until the day of the storm when Jonah is thrown over board and God tells whale to swallow Jonah. Jonah is in Whale's belly for three days until God tells Whale to spit Jonah back onto dry land. The story does not talk about why Jonah was in the boat or why he was thrown over board (which is all very crucial information to this story). This stor This is the story of Jonah and the Whale from the whale's perspective. The main character is simply called Whale. He lives with his family, eats and plays until the day of the storm when Jonah is thrown over board and God tells whale to swallow Jonah. Jonah is in Whale's belly for three days until God tells Whale to spit Jonah back onto dry land. The story does not talk about why Jonah was in the boat or why he was thrown over board (which is all very crucial information to this story). You probably know the Biblical story of Jonah and the Whale and why Jonah was swallowed up. BUT, did you ever think about what the whale was thinking? Eileen Spinelli’s book, “Jonah’s Whale” answers that question! I really liked this clever re-telling of the story Jonah and the Whale. It was interesting to see how Mrs. Spinelli told the story through the eyes of the whale. At one point in the story the whale gets a bit frustrated that he has a man in his belly and wonders “What now?” The illustra You probably know the Biblical story of Jonah and the Whale and why Jonah was swallowed up. BUT, did you ever think about what the whale was thinking? Eileen Spinelli’s book, “Jonah’s Whale” answers that question! I really liked this clever re-telling of the story Jonah and the Whale. It was interesting to see how Mrs. Spinelli told the story through the eyes of the whale. At one point in the story the whale gets a bit frustrated that he has a man in his belly and wonders “What now?” The illustrations in the book are marvelous and really add to the story. I think the book would make a great read aloud and an awesome bed-time story. I think its cool to see how authors can re-tell existing stories and I think Mrs. Spinelli did a great job with this one! This telling of the Bible story of Jonah's Whale, told from the perspective of the whale, can take its place alongside other outstanding picture books of the year. Whale is an instrument in God's hands as he saves the drowning Jonah, shelters him, and then - when God asks - disgorges him on the shore. He spends the remainder of his life at the ready to follow God's voice. This is an exquisite book - both the story and the illustrations. I loved the whale's perspective: that he had been created by This telling of the Bible story of Jonah's Whale, told from the perspective of the whale, can take its place alongside other outstanding picture books of the year. Children are familiar with the story of Jonah, the prophet who fled from the Lord and wound up in the belly of a whale. But what about that whale? Where did he come from? What was his story? Spinelli tries to imagine HIS side of the story in this nicely illustrated picture book. And while I really liked the pictures, I did find the story a little odd. The whale listens to the Lord and goes to save Jonah. But he also prays. That struck me as weird. I don't think I would buy this one, but I might Children are familiar with the story of Jonah, the prophet who fled from the Lord and wound up in the belly of a whale. But what about that whale? Where did he come from? What was his story? Spinelli tries to imagine HIS side of the story in this nicely illustrated picture book. And while I really liked the pictures, I did find the story a little odd. The whale listens to the Lord and goes to save Jonah. But he also prays. That struck me as weird. I don't think I would buy this one, but I might get it from the library. The simple text and soft, comforting illustrations make the story of Jonah’s whale very endearing. Told from the point-of-view of the whale, it gives the gentle message of what it means to obey and to wait on the Lord. This book does not explain Jonah’s story, and at first this bothered me. He is thrown overboard because he is at fault for the storm, but that is the only explanation given. Upon a second reading though I began to appreciate this story for what it was. It was never meant to be Jon The simple text and soft, comforting illustrations make the story of Jonah’s whale very endearing. Told from the point-of-view of the whale, it gives the gentle message of what it means to obey and to wait on the Lord. This book does not explain Jonah’s story, and at first this bothered me. He is thrown overboard because he is at fault for the storm, but that is the only explanation given. Upon a second reading though I began to appreciate this story for what it was. It was never meant to be Jonah’s story, but the whale’s. And the message that it delivers is both biblical and beautiful. This children's book tells the Bible story of Jonah and the whale from the whale's point of view. The illustrations were nice. I wasn't particularly drawn in by the story, even Jonah's journey is one of my favorite stories from the Bible. Perhaps the book was aimed at a younger age range than I anticipated, I'm not certain. It's a cute book, but it hardly grabbed me. A wonderful book. The story of Jonah told from the whale's point of view revives an old story and makes it fresh. Told in a poet's tongue, accessible and lyric, it's thoughtful and thought-provoking for children. This is a beautifully illustrated children's book telling the story of Jonah and the whale from the whale's point of view. Whale tells how God has cared for him and how God asked him to save Jonah when he was thrown overboard. Lovely story. A perfect children's picture book for a Christian family. Must remember for when I have kids! Does notpack the punch of the Biblical version, but telling the story from the whale's point of view is interesting. Interesting read. Never heard the story of Jonah and the Whale through the point of view of the Whale before. I love that the story is told through the whale's voice. The illustrations are beautiful and Spinelli's telling of the tale gives children a gentle understanding of this important Biblical story. Classic Bible story retold in a lyrical text with stunning illustrations --> Seriously, what's not to love? Sweet book with beautiful illustrations. Unusually written from the whale's perspective. Would have liked the story to develop just a wee bit more, but nicely done. I liked the illustrations in this one but the story was a somewhat different rendition of Jonah and the Whale. The story of Jonah and the whale from the whale's perspective. Very nicely done. This book ends somewhat abruptly. I appreciate that the whale was lonely and confused as was Jonah. Not exactly biblical, but many of the Jonah stories aren't. Beautiful illustrations. Love the point of view of this! An interesting version with very nice illustrations and a poetic style of prose. A beautifully illustrated and wonderfully retelling of the Bible story. We all loved this one. I'd love to own a copy. An unusual, enjoyable retelling from the whale's perspective of the biblical story. Lovely illustrations.